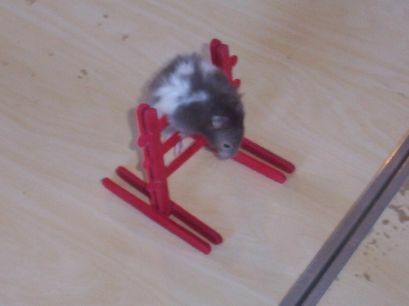 It seems like forever ago I heard about the sport of Rat Agility. Not much, very little, almost no information, was "out there". Deron is a wonderful husband. 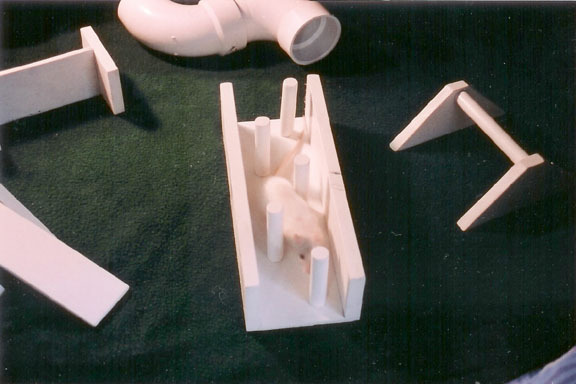 I had not had rats as pets for too long and I really, really wanted to train a rat an agility course. 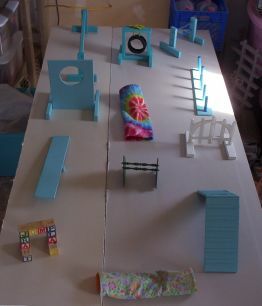 So with the tiny bit of information we gleaned off the Internet a tape measure and with a bit of Dog Agility Equipment knowledge (Deron had also been building pieces for me to play with our dogs) we began to plan, calculate and build Agility pieces for ratties. About the same I time I had my first litter of ratties that was bred in our rodent room. Sugar was one of those first babies. Gosh, she was adorable. 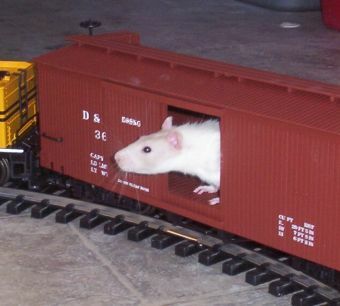 God sent me an easy rattie to train too. As the equipment came together, I could barely wait for the paint to dry on each piece before adding rat LOL. I was having a blast and Sugar learned quickly. We soon set up the www.theagilerat.com and www.fancyratagility.com websites because I wanted to spread the word on this great sport. And don't let me kid you, LOL, I was also looking for competition. I also set up the Yahoo Group called The Agile Rat. People started wanting us to make the rat sized agility equipment for their ratties and soon I was contacted by Rats Magazine. Was I ever thrilled and excited when they wanted to pay us for an article and photos of Sugar for an upcoming issue! WI is thick with rodent and rabbit owners and I had many good and fun loving friends there. I talked a few of them into joining me at a park on a Summer evening with the rabbits. 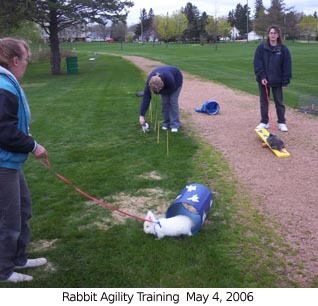 Deron and I also were also training a couple of rabbits on Agility Equipment we had made for them. We had a ball and started meeting a couple of times a month with our rabbits and ratties and playing with the equipment (each species it's own size). There were eight to 13 of us most nights and we would go out after for fast food and just laugh, talk animals and have the very best time!! 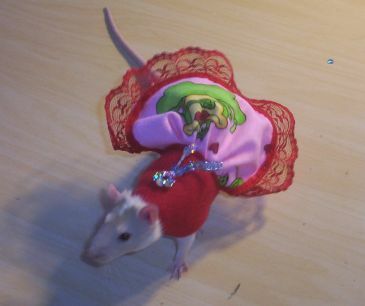 At that time I had a rattie named Tia that I was working with. Rats grow old so quickly and then pass away. While I did have and train other ratites on the equipment it was never quite the same as with Sugar. Then came Nineveh! Deron and I moved to SD in January 2007. For a while I could not have ratties (or rodents) because we had no house to have them in. But when the house was finished we started looking for ratties...we found we had to drive 100 miles one way to find anyone that had them....so of course my husband drove me not only to get them, but to several stores looking at them. Rapid City is not a huge city, but a big city all the same. We went from one end to the other and back again. Soon, now that I had a house and could home rodents again, we had Nineveh. She was named Nineveh because I knew I needed to start training again, but like Jonah, who did not want to go down to Nineveh (see the book of Jonah in the Holy Bible) I was just not in the mood to train. With naming her that, it motivated me. Nineveh was a little love from the beginning. She bonded to me quickly and strong. She was so funny, some days she would meander the course, other days run it. But her reward was not treats, God Lover Her, all she wanted was back up on my shoulder after her runs on the course. I have not yet picked up a copy of the new Rats Magazine (we do live 100 miles one way from the closest Pet Store) but they did once again contact us a few months ago about an article and for photos to cover Rat Agility. I am really hoping they printed some of Nineveh. As I said before rats grow old quickly and live short lives. Nineveh died on January 20, 2009. I will miss her terribly. While Nineveh had more equipment and ran a larger course, I often wondered who would have won a timed event between Nineveh and Sugar. Now maybe the Angles know. Time marches on,whether we want it to or not, please see our Training Little Mac page here at this site. 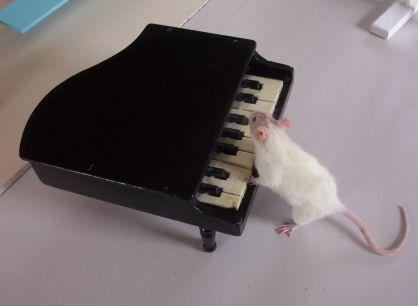 It might inspire you to train your own pet rat and or give you ideas and information on how to train a rat. 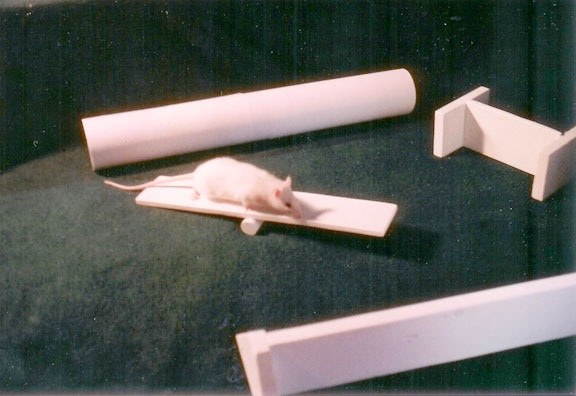 Along the way, that is since starting Sugar, I also started training gerbils, hamsters, mice and goats (had already been working with dogs) with agility. Please have a look at our sister sites.